As our business grows and our digitalization kicks in, it is time to reevaluate our process setup. 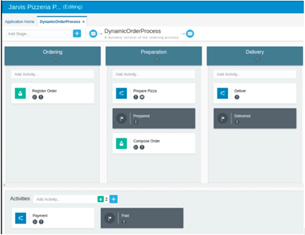 We are happy with our processes in Process Cloud, they are easy to set up and we can manage our process from Ordering a Pizza al the way through to delivery. However as with any BPMN, this a very structured process. Sometimes we require a bit more flexibility. We had a good chat with our friends from Oracle and we were very pleased to hear that our wish to become more flexible aligned with their plans for PCS. We were thinking towards a Case Management solution for our pizzas and got a very satisfying answer. In October 2017, Oracle released the Oracle Integration Cloud (OIC), not to be confused with the Integration Cloud Service (ICS). The Integration Cloud brings together several Low Code products. VBCS, Visual Builder Cloud Service, for developing user interfaces, ICS, Integration Cloud Service, for creating your integrations in the Oracle Cloud. Stream Analytics, for smart analytics on your integrations & processes. And last, but certainly not least PCS, Process Cloud Service, that in their new release includes Dynamic Processes. These Dynamic Processes have a lot of Case Management features and have a notation that feels a lot and reminds us of CMMN. Read the complete article here.